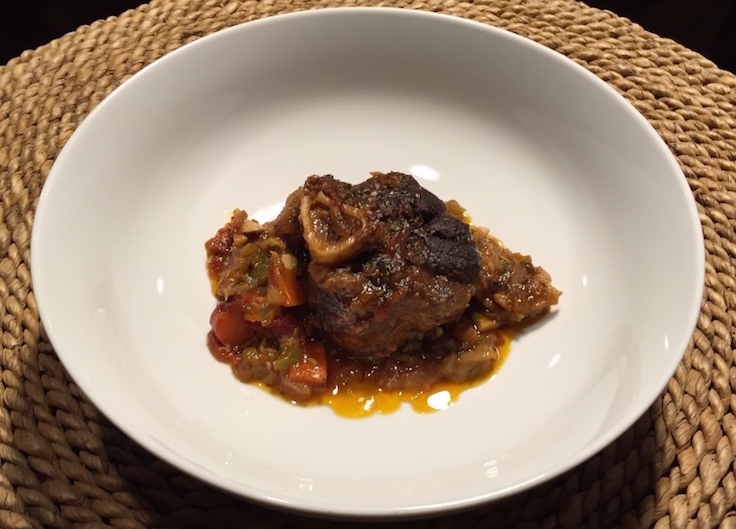 Osso Buco made with venison shanks – you’ll never grind your shanks again once you try this recipe. Let’s start out with what the shanks are. The shanks are the forelegs. There’s a lot of bone, a lot of tendons, and not a lot of meat. If you process your own deer, as you break down the quarters, you get to the shank and think: “ugh, there is NO WAY I can get any clean meat off of that”. All gristle and bone – not worth the effort. 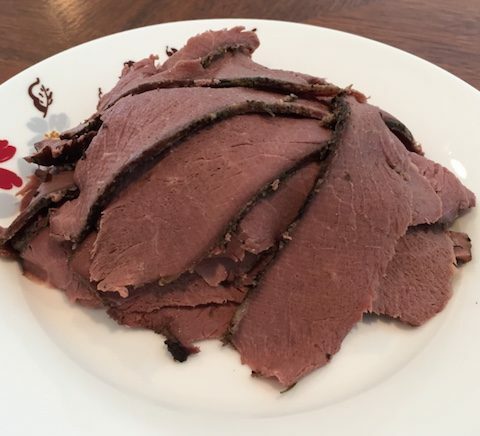 Many hunters don’t even try to separate the meat out – just cut off what you can, and throw it in the grinder pile to let it do the hard work. I guess that is a fine way to go, but I don’t want all that gristle in my burgers OR jerky. Well, fortunately, there is a MUCH easier way to harvest the meat from the shanks. Plus you can save time butchering – simply free the shank bone with all the meat on, and package it up for the freezer. As I’ve discussed before, I like options. 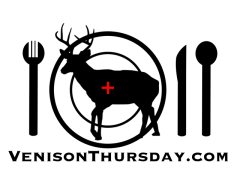 The choices you make when you butcher your deer will impact your options when you want to cook your meals. 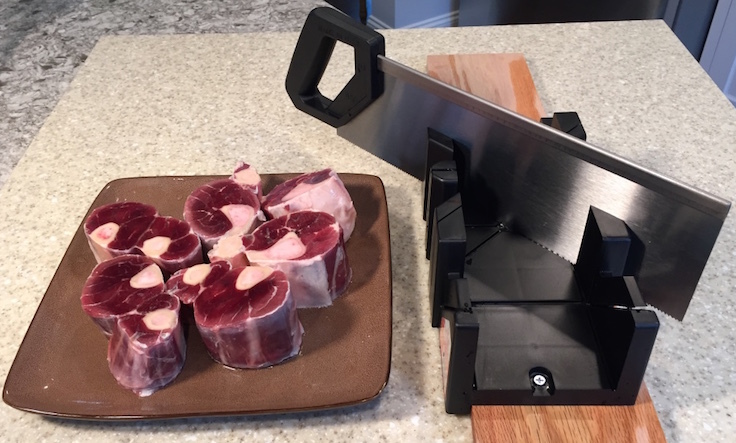 By saving the shanks whole, with the bone in, you have an array of choices, from osso buco, to whole braised shanks, to, if you really wanted, sure, scrape the meat off and grind it. Because of the nature of the shanks, they are a tough cut. 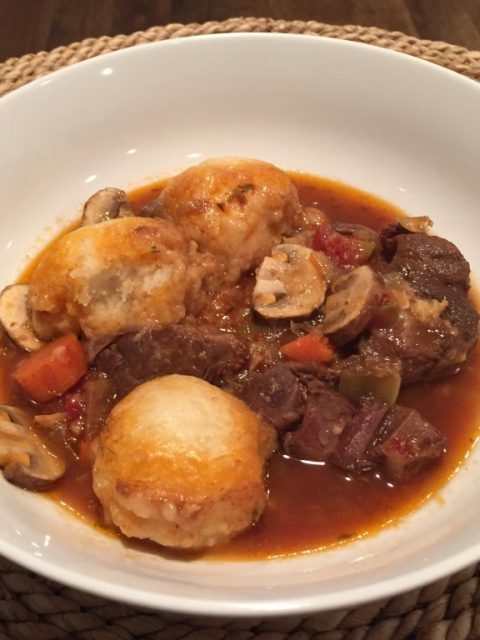 Even if you choose to debone them, you will need to plan on some slow cooking method – and personally, I’ll take any form of braised shank over a ground venison meal – any day. 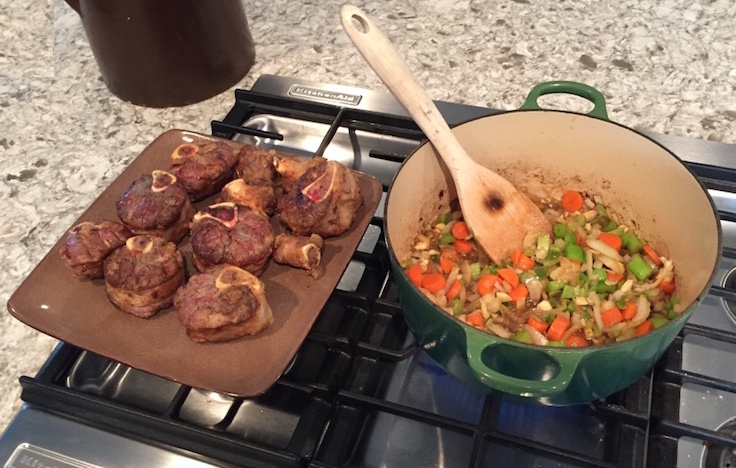 Venison shanks are a pain to cut by hand – unless you use something to hold them in place. A plastic miter box works great! Ok, so we already know what the shanks are. 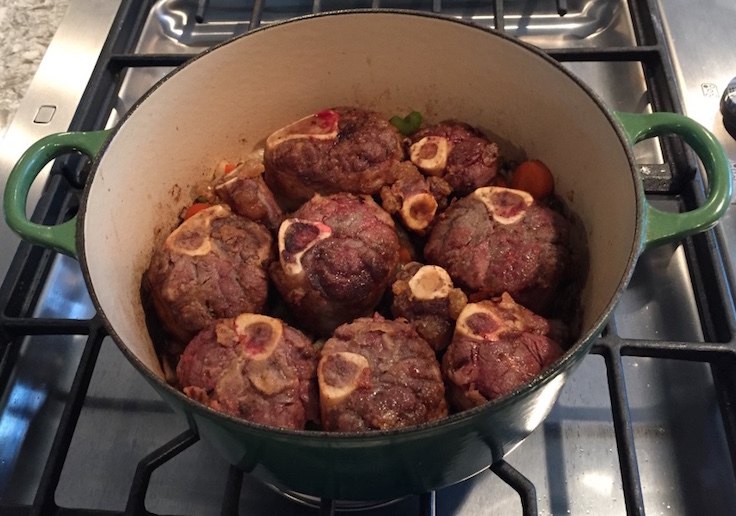 You can leave them whole – there are some great braised shank recipes out there, but my preference is to cut them up and make osso buco. 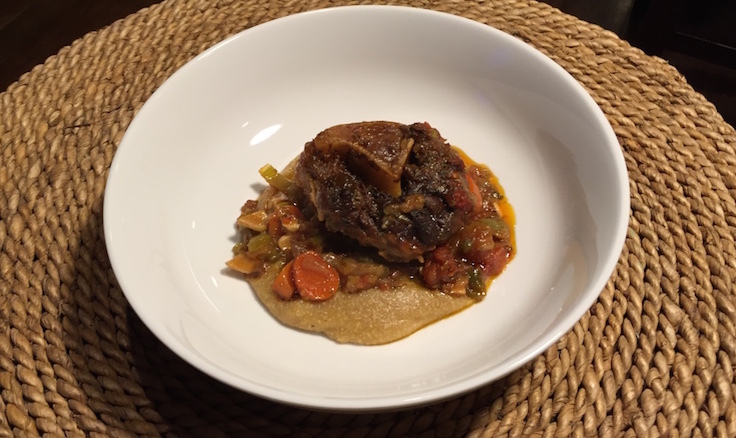 Osso buco is Italian – literally “bone hole”, a reference in the dish to the marrow in the bone as it cooks. But how do we get them into those nice little disks? The best way? 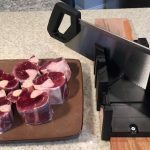 Have a friend with a meat bandsaw that can cut them for you. You can even use your own bandsaw if you want, but it will NOT be fun to clean. You can use a reciprocating saw too, like we did for our stew. A lot of times, I just use a good old fashioned hand saw and a plastic miter box. Perfect cuts in wood works for perfect cuts in deer too! Regardless of the saw you use (outside of a bandsaw), the hard part is holding the shank steady as you cut. That is what I use the miter box for. Without something to hold it steady, you will go back to dedicating your shanks to the grinder again in a hurry. On top of that, always cut it straight out of the freezer. You want the shanks frozen solid as you cut them – and the saw will cut it as easy as wood. I usually freeze two shanks together, and as they are frozen together, I cut them as one – two disks from one cut! I mount my miter box to a board, and then I clamp that board to my counter. This keeps everything set up rock solid, yet easy to break down for cleaning. After you cut your shanks, they will likely have some “bone dust” on them. This scrapes right off with a butter knife. I’ll scrape them down then rinse them off and they will look like they do in the pictures here. Two shanks from a deer will nicely fill a 4.5 quart dutch oven. After you cut your shanks into discs, salt and pepper both sides and let them defrost. Once defrosted, preheat your oven to 325°. In a dutch oven, add enough oil to cover the bottom, and heat it on the stove over medium high heat. Dust the shank disks in flour, and brown on all sides. Don’t overcrowd the dutch oven – only brown a few pieces at a time, or what will reasonably fit. Set the venison to the side once browned. In the same dutch oven, add a little butter, and sauté the onion, garlic, peppers, carrots, and celery, until the onions turn translucent. Add the spices to taste, about a half tablespoon each if using dried. Stir. Layer in the venison, so you can see the flats of the disks. This can be a bit like playing Tetris – I can usually fit all pieces from two shanks in if I cut them closer to 2 inches. Add the crushed tomatoes (try to fill the gaps). Add enough beef broth to just cover the shanks – usually about a cup. Add more broth as it cooks if needed to maintain this level. Salt and pepper to taste. Cover the dutch oven and transfer it to the oven. Cook for 4 hours, or until the meat easily separates, checking the fluid level every hour. 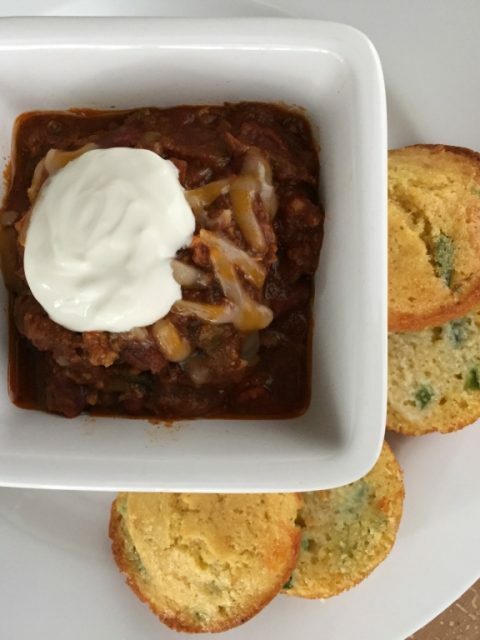 Serve over rice, noodles, or polenta! Venison Osso Buco on beef broth polenta.